The sky was dark over the lake and I stood on the edge of the water, throwing rocks with every bit of strength that I had in my arm. I didn’t care at all where the rocks landed. There wasn’t anyone anywhere nearby; and it wasn’t as if I was aiming at anything in particular. All I really needed to do was release some energy. Even after hours of the most earnest prayer I’ve ever prayed – complete with weeping and even anger – I still felt intensely overwhelmed with energy. Hours of prayer had left my voice raspy and my mind unable to focus, so I just stood there throwing rocks … not ready to call it quits or get into my truck and drive back home. Even when the rain began to fall I stayed there throwing rocks until my arm finally followed my voice and gave out. I won’t go into detail about what it was that prompted those prayers. It doesn’t really matter for this post and even the circumstances have been overcome by events since then. But I bring it up for a few reasons. First, it was a life-changing event because, up until then, I had only prayed simple, well-mannered prayers like, “Thanks for the food/clothing/shelter/conditions/etcetera that I enjoy. Please make such-and-such happen.” And while respectfulness is completely necessary in every prayer (we’re talking to the Sovereign of the whole universe, for pity’s sake), there’s also something to be said for being more real in your prayers. Why should we cover up the anger or disappointment we’re feeling with plastic, mannerly words that come out more sarcastic than sincere? It’s not as if God doesn’t know what passions are stirring within us. Second, the fact that the circumstances were overcome by events so quickly after the experience revealed to me just how silly I can be when things don’t go my way. Was I somehow exceptional and distinct from every other person in the world to the point that my entire life should just fall into place the way I wanted it to? Was God somehow not keeping up His end of the bargain by making things go wrong? And what “bargain” did I make with God that He was breaking anyway? Was my salvation somehow a clause in a contract which also required Him have to provide me with happiness too? And was my heart, soul, mind and strength – promised in return for salvation – somehow worth that much anyway? God was already giving me a gift I could never earn – was I also expecting Him to make my life sweep along untouched by any frustration greater than a papercut or an occasional headache? Silliness seems to take on a life of its own when you become self-absorbed; and the strength of the passions on that lakeshore illustrated that silliness perfectly. Third, the anger and frustration I was going through was real (even if the reasons for, and logic leading up to, them were silly). Even though I believe that emotion in itself is a rather spurious reason to do anything, it’s obvious that God wants a relationship with us and a relationship seems rather impossible if we don’t talk to Him about the things which absorb us. He has told us what is important to Him, thereby breaking the ice and stretching out a hand of friendship to us. In response do we hide our most passionate selves from Him? Or do we open up to Him about everything; raw though it may be? I have a feeling that Daniel, Elijah, John the Baptist and other great prayer warriors wouldn’t have been that great at praying if they had limited their talks with God to courteous prayers around meals and bedtime. As a matter of fact, I doubt Daniel could have made it through the night in the den of lions without some rather sweaty prayers of terror. Nor could Elijah have remained sane while running for his life from a murderous tyrant king without praying more than a “thanks for that raven, Lord” prayer. Nor could J the B have made it thirty years eating little more than bugs without saying something to God about the frustration of hunger and itchy, camel-haired clothing. It therefore seems entirely justified to bring our pain and anger and irritation to Him … provided we do it with the intention of drawing closer to God in the process. Finally, in the immediate aftermath of that day, those prayers didn’t seem to accomplish anything. Nothing changed except that I was extremely worn out physically, mentally and spiritually. My circumstances didn’t change and, in fact, it seemed like the silence from God in answer to my anger was deeper than before. Why wasn’t God answering me? It may sound silly, but I almost expected God to be angry with my anger … and therefore answer me. As if I could provoke Him to shoot back an, “Oh yeah?! Well I’ll show you …” answer to the implications of my words. To be honest, I’m really glad God isn’t as impulsive as I am. Something tells me that any provocation would not end well. However, in the end, it did accomplish a lot. Not through any sort of disrespect in the encounter – something which never seems justified when conversing with God – but through the resulting knowledge that I was finally being real with a relationship which had previously been as sterile as an operating room. Certainly, over the previous couple of decades, I had found ways to grow closer to God: reading the Bible, singing songs, thinking about Biblical themes, listening to sermons and training sessions, and, of course, regular prayer time – even if it was relatively weak prayer. Nevertheless the progress of the relationship had seemed to stagnate a little and it only took one little life event to shake it up. It could have shaken it into a deeper inactivity or it could have shaken it into anger. Thank God it was the latter. Anger caused me to communicate, communication caused me to evaluate, and evaluation made me realize how nonchalant my faith had been. I’ve never been a fan of nonchalance, so I decided to dig deeper and become more committed. So, yeah, that day was pivotal for me. I won’t say that I would’ve fallen away from God without it (only God knows that) but I will definitely say that spiritual torpor was slowly killing me and I didn’t even realize it until that day. Which brings me to the real reason I’m writing this post: the story of Nathanael (also known as Bartholomew), the apostle of Christ. In my mind, I’m a lot like Nathanael. And maybe you are too? So let’s take a few inches of blog space to look together at his life. Honestly, we don’t know much about Nathanael other than the story of his calling in John 1. We know that he was from Cana (in Galilee), that his father was named Tolmai (I don’t know how helpful that is), that he abandoned Jesus after his arrest (just like the rest of the apostles), and that tradition says that, after bringing the gospel to India, he died a martyr’s death in the Balkans. He’s mentioned in only one verse in each of the synoptic gospels (Matthew, Mark and Luke), and in each of those it’s only in a list of the apostles. As a matter of fact, the only story that gives more than his name is that first meeting he has with Jesus in John 1. But I believe we can learn – or at least surmise – quite a lot about his character and predilections that can help us recognize Christ and follow Him better. It doesn’t say outright in this passage that Nathanael wanted to see and know the Messiah, but when Jesus was “found” by Philip, Philip then “found” Nathanael. Sure, it could have been a chance meeting, or it might have been deliberate. But either way, Philip knew that Nathanael needed to know … we have found the prophesied one! This verse always cracks me up. I might say the same thing if someone told me that the Messiah came from Oakland or a tiny town like Pickle’s Gap, Arkansas. Can anything good come from Clovis, NM? Can anything good come from a place that is so broken? Can anything good come from a place so remote and uncouth? Probably though, he was tired and suspicious. Tired of waiting for a promise that never seemed to materialize, and suspicious after each fake “Messiah” undermined the very real prophecies of God. No matter how much suspicion he felt, no matter how worn out he was, those things didn’t get in the way of Nathanael going. When Philip said, “Come and see,” Nathanael went and saw. He didn’t cower at home in Cana, whining, “Why haven’t you sent us the Messiah yet, Lord?” No … he investigated instead. He laid his heart on the line, one more time, to see what he longed to see; and this time he wasn’t disappointed. Most commentaries say that this was simply Jesus affirming the integrity of the man called Nathanael. Jesus was saying that he was honest and guileless. In other words, he was a good and decent man. I love that description of him; and I hope that Jesus would be able to say that about me. However, I wonder if there was something else in that statement? In fact, it would be something that would certainly apply to me as much as Nathanael. Imagine Jesus saying those words with a cocked eyebrow and a little half-smirk. Maybe also Jesus looked at him with love and then chuckled a little in a knowing way while talking? I’d take that to mean that Nathanael spoke his mind. “No deceit” … because he didn’t sugarcoat things unnecessarily. If something was good, Nathanael called it good. If something was bad, Nathanael called it bad. If something wasn’t the way Nathanael thought it should be, Nathanael told people. He didn’t hold back because he was CONVINCED of what he believed. No matter how tired and suspicious he might be, he couldn’t stop calling things what they were. He didn’t pull any punches in order to deceive. He was honest as the day is long. This conjecture on my part seems supported by what happens next. This part of the story is why I believe that Nathanael spoke his mind and called things as he saw them. 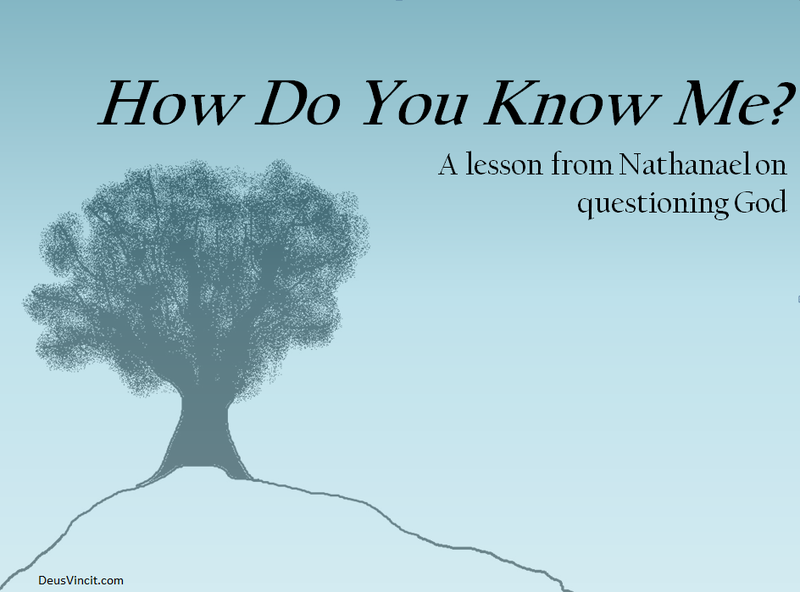 In fact, I think it proves it even more than the testing question, “How do you know me?” You see … SOMETHING must have happened under that fig tree; something very powerful in Nathanael’s life. We can guess that no one else was around when he was under the fig tree. Otherwise, Nathanael wouldn’t be surprised that Jesus had seen him. We can guess that whatever happened had been between Nathanael and God. Otherwise, Nathanael wouldn’t have immediately linked Jesus with the proclamation of “Son of God.” We can even guess that Nathanael had been praying earnestly. Otherwise, Nathanael might have just assumed that someone had put two and two together regarding other outspoken things he may have revealed to anyone who asked. All of that leads me to think that Nathanael had one of those real moments with God … under a fig tree in a backwater town of a hick province populated by troublesome people subjugated by the mighty Roman Empire. Perhaps he railed at God for the injustice he saw around him? Possibly he hurled his frustration at God’s silence in sobbing torrents of prayerful agony? Maybe, while in the privacy of a field populated with a single fig tree, he broke down and cried aloud for God to deliver His people? Or perhaps … just perhaps … he broke down in his tired suspicion and even questioned the existence of a God around whom he’d based his whole identity? It might have happened years in the past; he could have relived that day of prayer for years, wondering when he’d be answered. Or, it might have been only minutes before Philip ran up. Either way, Nathanael had to have been real with God as a matter of practice, because he WENT. He INVESTIGATED. He TESTED. He BELIEVED. I don’t know what brings this longing. I hope it’s an honest and honorable desire. I DO know this though: a day of brokenness and raw real-ness at the foot of a tree is never a bad thing. It might be the foot of a big American Black Oak, like me, or it might be at the foot of a shriveled Galilean fig tree, like Nathanael. Or, best of all, it might be at the foot of a rugged-hewn tree on a hill called Calvary.